What I find interesting about Nuage is their approach. Most startup networking companies these days limit their focus to one area of the network. The data center is certainly a popular area but others are focusing on the WAN as well. Nuage is tackling both. I heard a couple of times in the presentation statements like “users are stuck in the past” or “the network model has to be consistent”. The problem with any overlay based network solution is that ,at some point, you need to connect it back to the ‘normal’ network. Whether that entails bridging a physical appliance into the overlay, or actually peering the physical into the overlay, the story usually starts to get messy. What if everything from the DC to the branch was on one network model? Managed with the same set of policies? Nuage is suggesting that’s possible today with their solution. Another item they talk about was surrounding WAN technology as a whole. Having an MPLS WAN is not a cheap or easy proposition. The upfront cost of hardware is often tremendous even without considering the monthly costs of the circuits. The unintended byproduct of all of this is that you’re WAN technology roadmap is now in the control of the carrier. You get new features and functions as the carrier implements them in their network. Trust me, this isn’t something that happens frequently. If you need new network functionality your only option ,in most cases, is to deploy new endpoints and use the carrier as transport. In some cases, there’s just no way around this. If you need the SLAs and bandwidth offered by a dedicated carrier circuit, then you might be stuck. If not, you could start looking at using the internet as transport. In either case, Nuage can build that overlay network for you. And from the looks of it, Nuage has spent quite a bit of time making sure that their product is easy to deploy by providing you with multiple provisioning options. This makes me happy on so many levels. And their use cases? Fantastic! The example of using a container called ‘Clive the user’ for testing was awesome. How many times have you deployed a network change late at night but not been able to test it? What if you could work with a developer to build application test containers that would simulate live user traffic? The model now changes from “make the change and hope no one screams tomorrow” to “make the change, deploy the container, and know for sure it worked as expected”. Did I mention that the docker pull/run is all done through the Nuage management console? Overall, I’m impressed with what I’ve seen. 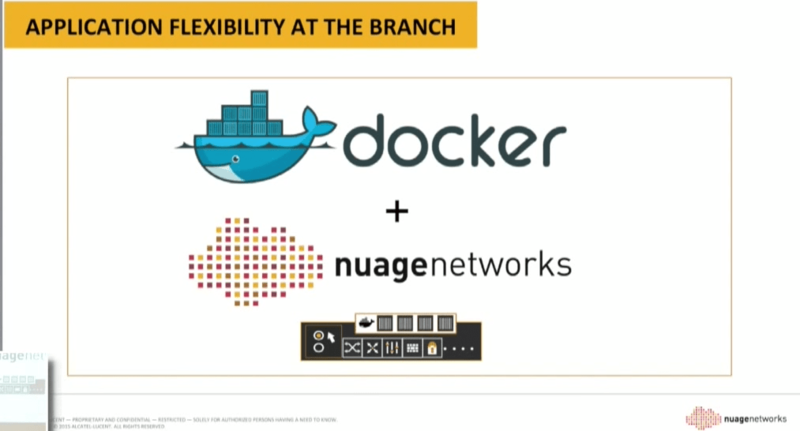 Nuage certainly has some new ideas here and I was thrilled to see them integrate a platform like Docker into their solution. I think there’s a lot to be said for a vendor that’s willing to let you run your own app (container) on their dedicated network appliance. I do have some reservations/questions around scale and complexity but only because they weren’t explicitly covered in the NDF10 session. More reading will need to be done on that and hopefully I can find some time to play around with it.